Need more information about booking Home 8417960 ? Feel like home in our resort style accommodation with a large Pool, beautiful palms and frangipanis while relaxing in a hammock and watching the sunset! We are only a 20 min. 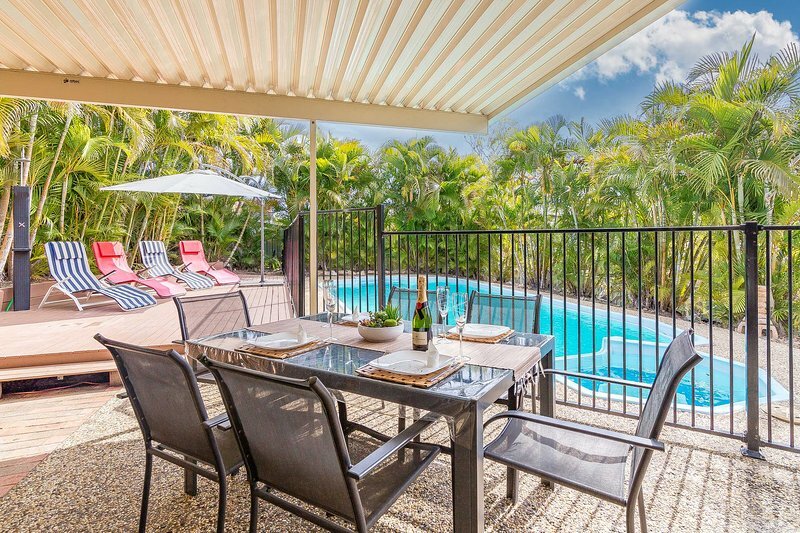 drive from the Brisbane CBD or Theme Parks or 40 min. to the Gold Coast! 600 m walking distance to Hyperdome shopping centre, 24/7 shop and a 5 min drive to the Koala Centre in Daisy Hill ! Kids under 3 stay for free and we can provide a cot. One dog is welcome outside in the garden under the roof. Please note that the Owners live onsite and Pool is shared with them. The guest house also offers 4WD car hire to explore the islands. Owners live above. You can get in touch with Willi (the owner) through the contact form on this page. Send Willi (the owner) an email through the contact form on this page. Alternatively, if there’s a phone number on this page, you can call them. How do I contact Willi (the owner)? If you’ve already booked, go to Manage your holiday booking to view Willi the owner's contact details or send them a message. Or send Willi (the owner) an enquiry through the Contact the owner/manager form if you’d like a quote or more info first. When you pay online through the Book your stay form, a booking request is sent to Willi (the owner). You’ll find out within 24 hours whether they’ve accepted - no money will leave your account before then. You can also request a quote from Willi (the owner) through the contact form. The owner will email you the total cost for your dates and a link to book and pay online. Use the Book your stay form to pay provisionally online. You can pay by credit/debit card or PayPal. Willi (the owner) will have 24 hours to accept the booking and no money will leave your account before then. Why can't I call Willi (the owner) before booking? You’ll need to contact Willi (the owner) to do this. Send them a message in Manage your holiday booking or through the contact form on this page. You can request to change the dates or number of people on your booking via the Manage your holiday booking page. To change your holiday dates use the Edit booking button. If you need to change the number of guests staying then send Willi (the owner) a message. If Willi (the owner) agrees, they’ll send you a revised quote outlining the changes. You can review and accept/decline this from the Manage your holiday booking page. You’ll have 48 hours to take action before the revised quote expires.